Out of concern that unlicensed motor carrier for hire services were not being properly regulated, a group establishes as Hana Highway Regulation and volunteer begins collecting roadside data along the Hana highway. Points collected include car counts at various locations along the highway and intricacies include type of car [local, commercial, rental, government, etc], approximate passengers per vehicle, in addition to a log of illegal tour operators and their specifics including vehicle make and model, license plate, infraction. Maui News article: Senator J. Kalani English commends the efforts of Hana Highway Regulation and suggests the PUC monitor how many permits are given out for road tours to Hana. English notes the Road to Hana as the No. 2 tourist activity - behind Haleakala Crater. Bob Carroll, then County Council member says he noticed an increase in traffic along the highway. 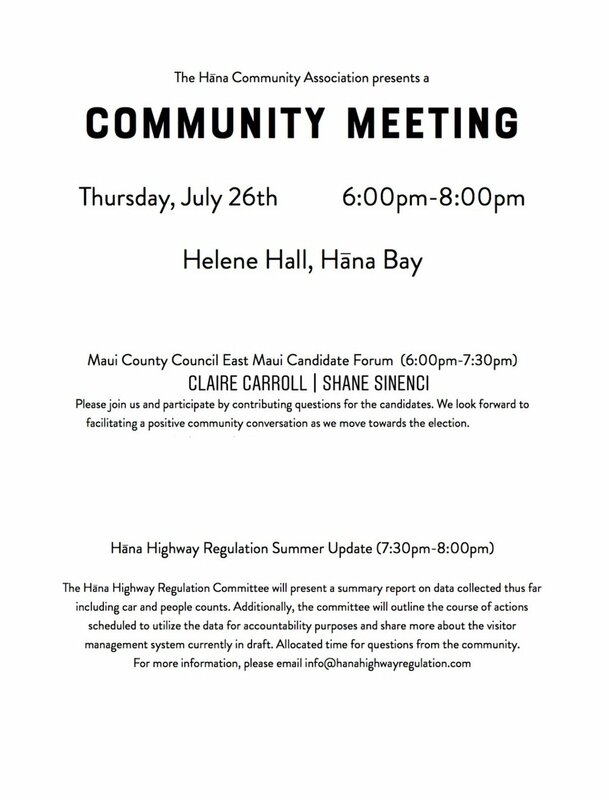 Meeting minutes available and include testimonies from residents, business owners, a large majority of those present being legal commercial operators with concerns of the rampant unlicensed commercial activity spread throughout the Road to Hana industry. A community input meeting hosted by Hana Highway Regulation. Meeting minutes available and include testimonies from residents, business owners, a large majority of those present being residents expressing concern about impacts of the increase of traffic and visitors. A community input meeting hosted by Hana Highway Regulation. National Park implements Sunrise Reservation Protocol. Hana Community Association adopts the Hana Highway Regulation as an initiative and publishes the Road to Hana Code of Conduct as its first objective, followed by education and outreach efforts. Road to Hana Code of Conduct presented as a “community soundbite” audio piece by Hawaii Public Radio. Promoting visitor awareness, scheduled steps for the initiative. The Conversation with Chris Vandercook; Regulating the Hana Highway. Road to Hana Code of Conduct presented as audio piece by Hawaii Public Radio. Individual Presentation; Visitor industry staff education and awareness effort. Road to Hana Code of Conduct presented as the subject matter presented by Hana Highway Regulation Committee. At this meeting, representatives from the National Park at Haleakala outline a 75% decrease in emergency services in light of newly established Sunrise Reservation protocol. Maui News article: One ocean-related fatality, and one trespassing related injury - same day. July, August and September notes four airlifts out of Kaihalulu [Red Sand] Beach. Installation of 75 delineators at Waikani waterfall. Napua Hueu predicts increase in East Maui commercial operators in light of the Haleakala concession scale back. Lieutenant Hankins notes education is the thing that will change bad behaviors by visitors. Hana Highway Regulation volunteers begin using notice slips on local vehicles suspected to be illegally parked, trespassing on private property, conducting unlicensed commercial activity and or commercial activity within a sacred site. Notices include contact information for outreach follow-up and have proven an effective means to educating the public on specifics of property ownership and deterring continued infractions. Hana Highway Regulation begins visitor management exercises, collecting intricate data at the 15 locations identified as impacted by tourism along the Road to Hana. Specifics relating to the various infractions of the four culprit activities creating chaos along the Road to Hana are elaborated through this data collection effort; illegal parking, trespassing on private property, conducting unlicensed commercial activity and commercial activity within a sacred site. Through this process the volunteers also record and compile cultural, environmental and social impact statements from residents in each area, with regard to how tourism has affected their lifestyle. Summary report on data collected thus far including car and people counts. Question and Answer portion for the candidates and Hana Highway Regulation Committee Chair Napua Hueu. Potential solutions to the issue of over tourism are discussed including presentation of a preliminary draft of the Road to Hana Visitor Safety System which has been curated by the Hana Highway Regulation Committee. Summary perspective on the Road to Hana industry and the fragile Hana highway. Considered to be four times over capacity, the report identifies the four culprit activities creating chaos along the Road to Hana; illegal parking, trespassing on private property, conducting unlicensed commercial activity and commercial activity within a sacred site. The report also summarizes roadside data to provide an update count on illegal tour operators and other highway activity specifics. The report details the role that social media influencers and the internet plays in exploitation of sacred sites and private properties. Valley Isle Excursions, Polynesian Adventure Tours, Open Eye Tours, Holoholo Tours, Makoa Quest, Platinum Tours and Aloha Eco Adventures. These companies have made the commitment to respect community policy through in-person meetings with Hana Community Association and by signed agreement and exchange of certificate of insurance. The Hana Highway Regulation has provided these companies with individual training opportunities to enhance their staff’s comprehension of Road to Hana protocols in the commercial capacity. General community updates and a data report by the Hana Highway Regulation Committee, led by Napua Hueu reporting that the summary of Summer exercises concluded that field-advisors providing visitor education on location was most effective and provided an enriched visitor experience. The Committee of Hana Highway Regulation provides a presentation of their visitor safety system in draft. News Highlight; Hana Highway group looks to make road safer while raising cultural awareness. The volunteer committee of Hana Highway Regulation provides emergency visitor safety services at Hookipa Beach Park amidst a County Park shutdown due to expected large surf. Five rescued in the course of two days at Kaihalulu Beach in Hana. Beachgoers swept out to Sea, rescued. The Hana Highway Regulation committee has identified illegal parking and private property trespassing as detriments to visitor safety and resident peace. These issues directly contribute to overcrowding and other intrusive effects on the day to day life of our community. Although increased signage has had some impact, field advisors report that continuing offenses to community policy are extensive. Sites experiencing difficulties have seen a 96% reduction in traffic hazards and resident frustrations when a field advisor is on the premises mediating and alleviating the offenses as they present themselves. The Hana Highway Regulation has been conducting research on the Road to Hana industries since 2016 through various roadside surveys counting traffic and logging general activity patterns. 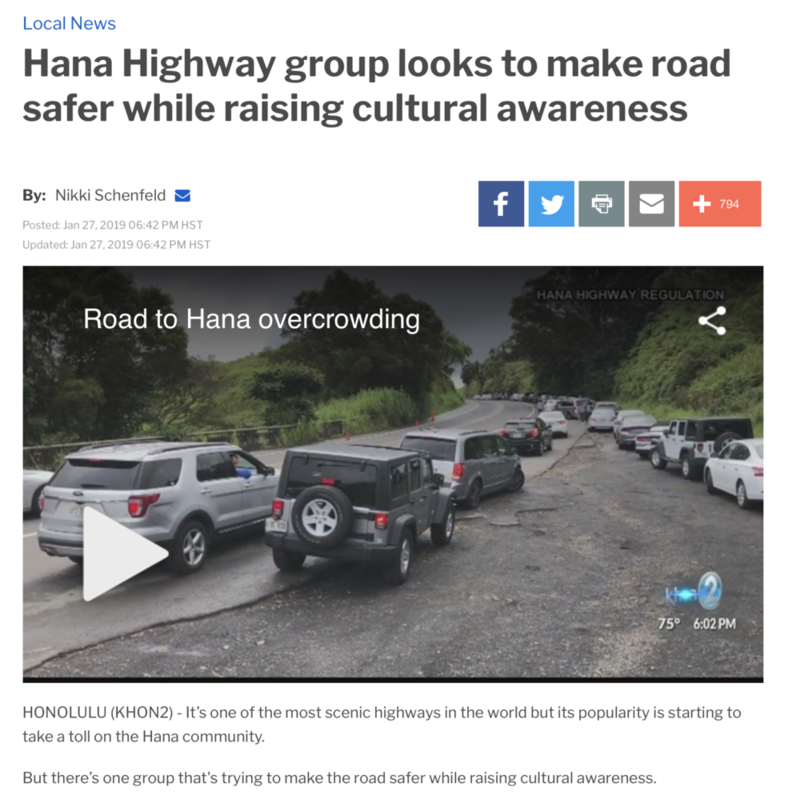 In 2017, the Hana Community Association adopted the Hana Highway Regulation as an organization initiative to address the growing concerns from the community. We maintain a database of commercial operators based on web research, traffic surveys, hot spot surveillance, offense submissions by the community and field reports by survey volunteers. We have been keeping record of the tours and transportation industry for nearly two years and just began expanding our database to include food and beverage operators. Based on our research, the Hana Highway has experienced an exponential increase in visitors from both independent travelers to commercial tours. The Road to Hana, its parking and comfort station infrastructure, was never designed or intended for this magnitude of use and its associated traffic and human impact. Based on our most recent traffic data, the Road to Hana is considered to be four times over capacity and is considered to be insufficient to service the current level of use which is creating issues such as but not limited to; overcrowding, illegal parking, unsafe driving conditions, private property trespassing, injuries, emergency rescues, unlicensed commercial activity, economic adversities, waste disposal concerns, public facility cleanliness, plumbing issues, stream and ocean contamination, health hazards and death. The Road to Hana Code of Conduct is available as a page on our website, it has been published by various media outlets and visitor industry platforms. We continue to push these guidelines for safer embarkments by all Hana Highway travelers, both kama’aina and visitor. We are preparing an infographic brochure to serve as an educational piece that outlines the Code of Conduct which will include a map of the entire route and other helpful points. We are composing various scripts to create media pieces for promotion through our airports, rental car companies, resorts, activity agencies and other avenues of pre-arrival visitor communication. We recently launched our Commercial Partners Program and Certification opportunity for both tours and transportation as well as food and beverage vendors along the highway. Our Registered Commercial Partners program is an independent verification system to distinguish operators in compliance and our certification opportunity identifies industry leaders in sustainable tourism. Some of the criteria for review include verification of business compliance with all federal, state, and local regulations for all products and services in addition to commitment of abiding by all necessary permit conditions. The company will demonstrate commitment to the Road to Hana Code of Conduct. The company will provide accurate information to guests that can be referenced and utilizes marketing that is accurate. The company demonstrates responsible travel practices in addition to contributing to conservation and community efforts annually. We intend for both the Commercial Partners Program and Certification opportunity to encourage better business practices along the Road to Hana. We have identified illegal parking and private property trespassing as detriments to visitor safety and resident peace. These issues directly contribute to overcrowding and other intrusive effects on the day to day life of our community. Although increased signage has had some impact, field advisors report that continuing offenses to community policy are extensive. Sites experiencing difficulties have seen a 96% reduction in traffic hazards and resident frustrations when a field advisor is on the premises mediating and alleviating the offenses as they present themselves. Typically one or any combination of the following acts are the culprit of roadside chaos; illegal parking, private property trespassing, unlicensed commercial activity and /or commercial activity within sacred sites. Over thousands of years, the indigenous people of Hawai’i have developed and harnessed knowledge that strengthens environment sustainability and fosters cultural well-being. We are drafting a visitor safety system program that draws upon this insight and connection to country to protect and manage land and shorelines along the Road to Hana. We would like to implement field advisors at the various areas seeing heaviest impact and complications. Resident volunteers will enter a voluntary agreement with the Hana Community Association and adhere to policies and procedures to protect the biodiversity; animals, plants and other species that call the Road to Hana home and to conserve the area’s cultural resources such as sacred sites and water sources. We will manage district volunteers impressing the effectiveness and value of place-specific expertise for the role of field advisors in relation to the visitor safety system. More residents are expressing an affinity to protect the culture and wildlife along the Road to Hana but government funding is severely lacking and doesn’t meet the demand to protect the vast land and sea country of our home region. We plan to secure financial resources to implement phase one of our visitor safety system through a crowd-funding campaign and we look forward to your support in that capacity. An announcement will be made when the campaign is live and you will be able to learn more about the system at that time and contribute feedback to the Hana Community Association to help in final considerations as the project moves forward. Volunteer Napua Hueu collects traffic and visitor data at Keanae Peninsula. The primary nuisances and unfortunate events that occur along the Road to Hana are caused by drivers parking illegally, individuals trespassing on private property and commercial operators that are either conducting unlicensed commercial activity or conducting commercial activity within a sacred sight. All of these incidents, paired with an unregulated visitor count [currently beyond the venue’s capacity] - create a significant compromise to the Road to Hana economy and ecosystem. This situation, left unmanaged, negatively effects the quality of life for residents and jeopardizes the safety of visitors along the Hana Highway. The act of drivers parking vehicles in an illegal, prohibited or restricted area that causes an obstruction to traffic, a traffic hazard or a dangerous situation. Any vehicle parked outside the white lines that mark the shoulders of roadways is considered to be an illegal parking violation. At various sights along the highway there is adequate room for a few cars to park alongside the road however, if a vehicle is protruding outside the white lines and into the roadway, or if the vehicle is parked beneath a no parking sign or within the area of a designated no parking zone, it would be considered a parking violation. Danger increases when cars are parked outside the white lines, facing the opposite direction of traffic flow and / or hindering bridge clearance. Entering or remaining on a premises or property in which one does not have the authorization, license or privilege to do so causing danger to themselves and a liability to the property owner. It also causes overcrowding and sight desecration. Laws vary slightly from state to state with some being very basic and others having very detailed requirements for providing proper notice. Outlined in §708-814, Hawaii trespassing laws state that a person commits trespassing when they knowingly enter and remain on a property after a reasonable warning by the owner, an authorized representative or law enforcement officer. This is applicable to commercial properties as well. For agricultural lands that are neither enclose nor designed to keep intruders out, signage must be visibly displayed and clearly noticeable from outside the property. With the lack of property management, most of the highlight sights become unrightfully crowded causing the area’s ecosystem to be disregarded; desecrated with litter and feces. Soliciting and or facilitating commercial services without the adequate legalities in place, causing overcrowding and economic instability for the Road to Hana industry. The State of Hawaii requires all individuals/entities engaged in commercial, for-profit tour activity by vehicle on public roads, be licensed and permitted by the State of Hawaii’s Public Utilities Commission. Legally Licensed Tour Operators are assigned a PUC License Number which by law must be displayed in a conspicuous location on the outside of touring vehicles. Most are located on the front and rear bumper area of the touring vehicle and look similar to this: PUC–1234-C. It is ILLEGAL for anyone to engage in for-profit, commercial tours on public roadways without a PUC License and those engaging in such activities are breaking the law. Legally Licensed Food Vendors are issued a department of health permit which by law must be displayed in a conspicuous location within the eatery. It is against the law for an unlicensed individual/entity to advertise or solicit commercial services without the proper legalities. Presently there are numerous unlicensed tour operations advertising illegal tours online. TripAdvisor has (35) Listings Under Private Tours on Maui, at least (18) are unlicensed or illegal. Of the (35) Restaurants logged along the Road to Hana on Tripadvisor, at least (5) lack a health permit and therefore considered unlicensed commercial activity. There is a lack of regulation presence by the public utilities commission and the department of health which festers the black market that currently thrives. This creates overcrowding, a dangerous predicament for the general public and an unfair competitive advantage for the illegal operators at the expense of legitimate, licensed companies. Although many of these unlicensed ground tours have stellar reviews, great employees and some have been operating for several years - the fact still remains that they are operating illegally, likely lacking other adequate insurances, permits or certificates and subsequently possibly miscounting the appropriate scope of taxations in the realms of both government and community give-back. You can see if a tour operator is licensed via the PUC website at www.puc.hawaii.gov in the Advanced Docket Search section. Commercial activity within a sacred sight by either a legal tour operator or illegal tour operator, both create an unfair competitive advantage for those soliciting and facilitating commercial services on or beyond private property which creates a dangerous predicament for the trespassing party and a severe liability to property owners. It causes unrightful overcrowding and sight desecration. Commercial activity within a sacred sight also creates an economic instability for the Road to Hana industry with legal operators in compliance and held accountable by various State and Federal agencies to following the rules and regulations. Legal operators in full compliance are not allowed to offer accommodations to sights located on or beyond private property which creates an unfair competitive advantage for the illegal and some of the daring legal operators who disregard laws and community policy, continuing to solicit / facilitate access to sights on or beyond private property. The majority of sacred sights (most on private property) rank the highest online based on the search for most popular sights on the island. Concierge and activity agents are more likely to book with companies who will agree to guest expectations therefore choosing those illegal and daring legal operators who will disregard laws and community policy to satisfy guest interests. This pushes those illegal and daring legal operators to the top of the list for most recommended or reviewed tour companies. Hana Highway Regulation will be exercising a visitor management system over Summer 2018. This is an example of the approach of a Field Advisor stationed stationed at Kaihalulu Red Sand Beach. MAUI VISITORS BUREAU HOSTS SAFETY SEMINARS, please see flyers below. 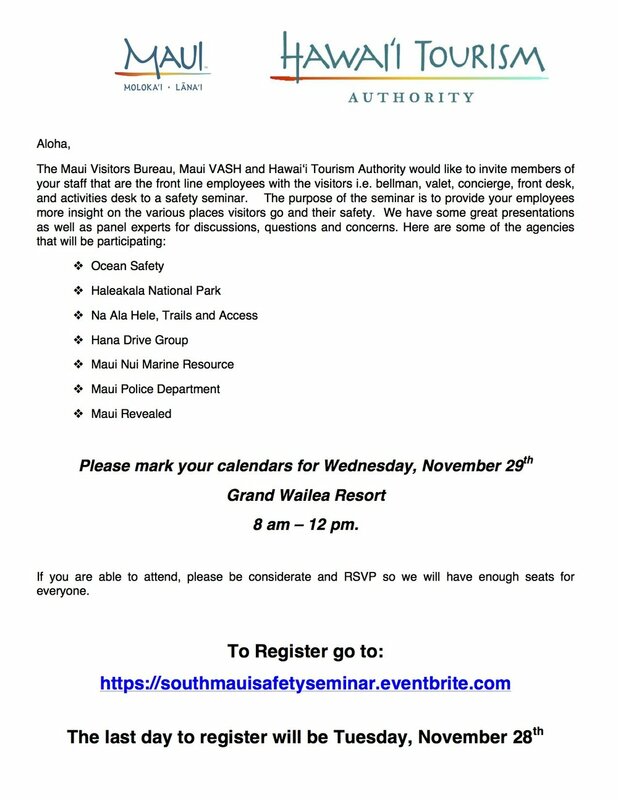 Maui Visitors Bureau coordinates a series of visitor safety conferences to be held at the Grand Wailea Resort on November 29th (8am-12pm) and on the West side at Sheraton Maui Resort & Spa on December 6th (8am-12pm). Please alert any hospitality industry staff to sit in on these free events to learn more about visitor safety. The Hana Highway Regulation committee will be making a presentation on the Road to Hana Code of Conduct among a panel of other county and state officials providing their insight on respective areas of expertise. To learn more please contact the Maui Visitors Bureau. Click here to visit Hawaii Public Radio site and listen to highlighted points from the recently published Road to Hana Code of Conduct. Promoting visitor and resident awareness are scheduled steps for the initiative. The Hana Community Association board votes to adopt the Hana Highway Regulation as an initiative and publishes The Road to Hana Code of Conduct as first objective. Peru introduces new rules for visiting Machu Picchu. Machu Picchu is unarguably one of the most famous and popular sites in South America and an iconic site within the world of travel. In 2007, Machu Picchu was voted as one of the New Seven Wonders of the World. But Machu Picchu’s popularity could also be a curse. The number of visitors to Machu Picchu each year has grown from the low 100,000s in the 1980s, to a peak of nearly 1.4 million tourists in 2014 – an approximate increase of 700%! This increased traffic is slowly “wearing away” the famed site.